How to plan a killer photo shoot for your blog. I started blogging full time in December of 2017. When I first started, I guess I underestimated how much work goes into photo shoots. No matter if it's just one person shooting themselves, or a team of bloggers shooting together, there is SO much that goes into an awesome blog shoot. Just last month, I did my first official lifestyle shoot for my blog. 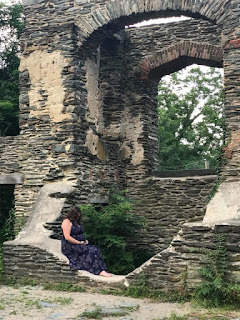 Since I'm obsessed with History, I did a history themed then and now photo shoot in a historic Civil War Town. This shoot was something that I wanted to do for months, and I was hesitant to do it because it was so much work. At the end of the day, my bestie and I went together and got some killer shots. After all of that, here is what I learned about planning a real shoot for your blog. Location scouting is SO important. So here's the story behind my blog shoot. I visited a historic town near me that I had been dying to visit for a long time. It was a dark and chilly day and I wasn't ready to shoot by any means. However, after exploring the town, I absolutely fell in love and decided I absolutely needed to shoot there. During my visit there, I took photos of all of the locations that I wanted to return to when it was time to shoot. This is so important because it makes your actual shoot go faster if you already know exactly the shots you are looking for. Read: Photography essentials every blogger needs. Timing is important-especially if you are doing an outdoor shoot. You don't want to shoot in the middle of the day when the sun is at its brightest. This is uncomfortable, makes you squint, and one side of your face will be very bright while the other side is a bit shaded. If you are doing an indoor shoot, you probably do want to go during the brightest part of the day. This is because you will need to catch as much natural light as you can to get the best shot. I definitely learned this one the hard way. Since I wear a lot of black clothing, I first started taking my own pics and quickly realized that it looked horrible with my black hair. My hair would often blend with my shirts and it just didn't look good at all. This is something I never would have cared about before. But once I started taking my photos and checking them out I noticed that it really doesn't look good when you blend in with your clothes, or the background you are against. 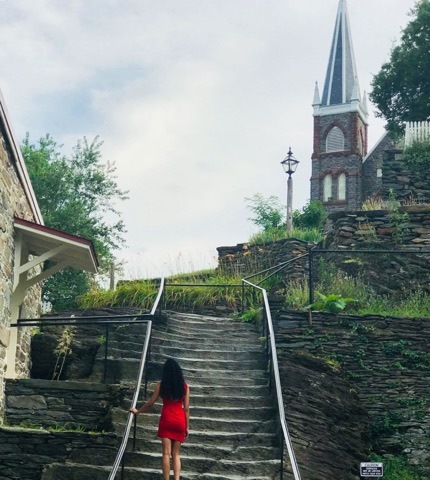 So when I went to Harpers Ferry to do the shoot, I had to choose between a red dress and a white dress. Although white is super cute, I was afraid it would look kind of bland against the mostly stone backgrounds that I was going to be working with. Because of this, I chose to wear my red dress. I am so glad I made that choice, because I think it was a good contrast against the ruins I was posing with. Now, when I visit the lavender field and the sunflower farm, I would wear the white dress because I wouldn't want to wear a bright color. It would take away from the beauty of the flowers. My advice is to experiment with your skin tone and fashion choices to find the right outfit for your shoot. Again, something else I had to learn about blog photography, is that I needed to learn how to pose. I am not a model and I think it's safe to say that I am pretty camera shy. The only way to get your posing down is to look at other people's posts for inspiration and then see what poses you like for yourself and practice posing before you go out to shoot. The worst thing would be to finish a shoot and then be unhappy with the shots. Fake it 'till you make it-and then edit like crazy! Wanna know a secret? I was wearing flip flops with my dress. That's right. And my bestie, who also took some maternity photos at this location wore a black active wear outfit the entire time we were hiking. When it was time to shoot, she threw on a maxi dress which covered her active wear and did a couple poses. The shots turned out perfect and no one will ever know that we both looked a hot mess most of the time on this trip. I made sure to edit my feet out of the shots you can't tell I was wearing the wrong shoes and her shots didn't even need editing because the dress fit perfectly over her clothes. Do what you have to do to make the shoot comfortable for you and edit out the flaws later. Trust me-it works! Have you joined my Facebook group for fasion, beauty, lifestyle, and travel bloggers yet? If you are looking to promote your blog posts, grow your social media accounts, get access to awesome resources and killer freebies, this group is for you! Did I miss anything? Let me know your best photo shoot tips in the comments! Great tips! I hate pictures of myself, so doing a whole photo shoot for my blog is something I’ve been putting off. Guess I should just bite the bullet. Your shots are beautiful! OMG, I feel so humbled! In only eight months you've learned more about photoshoots than I have in 9 years. I don't think you've missed anything. I already knew I needed to take 40-50 photos to get 2 or three that I don't hate. I disregarded my own advice on my last post. You look fabulous rocking that red dress in the photo above! Awesome tips 😃 I am learning the hard way how not to take photos. I definitely agree with avoiding photography outside when the sun is really bright - we were taking photos at a festival a couple of weeks ago so we didn't have much choice as it was all outside and it was so difficult to take a good picture. By the way, the red dress looks wonderful - such a contrast to the surroundings!